Yeah, yeah. 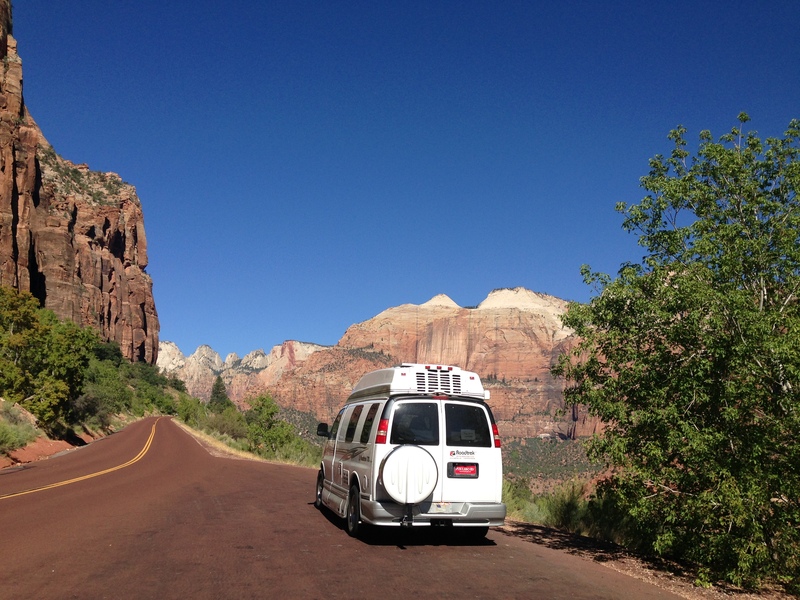 Zion National Park is beautiful and amazing and proof of God, etc. But let’s talk about what’s really important. Temperature control. It’s August. In the desert. It’s hot. My RV is a transformer version of a Chevy Express van. So basically a car. If it’s parked in the sun in 100+ degree heat, it can get a tiny bit warm inside. Not like, nice and toasty in front of fire drinking hot chocolate warm. More like, wow, I would be super embarrassed if I set out on this RV adventure and then died of being hot. The internet is full of RV hacks and a large number of them are focused on temperature control. How to keep the RV cool (or warm, but I’ve had no need to warm things up at any point yet). I’ve been reading up, plus watch what the experienced RVers do (I’m sure they all think I’m a crazy stalker). First, if you read a lot of RV campground reviews (and I do), you’ll sometimes see people giving mad props to the parks with lots of shady spots. And you might think (like I did), oh how lovely. That park sounds pretty and wooded and peaceful. I can totally get why this reviewer would add stars for shade trees. But you would be naive. You know sometimes it’s super hot and let’s say you’re going to the mall and maybe you’re in college so you have kind of a crappy car with vinyl seats. And so when you get to the mall you see this awesome parking spot under a tree and you think, yay, shady spot! Because you’re wearing these great shorts and you know that if you leave your car parked in the sun, when you get back into your car after browsing the Pacific Sun store and getting an Orange Julius (did I mention, it’s also 1992), you’ll sit down and all of your skin will instantly be burned from your body and you’ll have to spend the rest of the summer wearing the that one maxi dress you have. My point is that the sites at most RV parks are not shaded in any way. So when you find a park with shade, you give it as many stars as rvparkreviews.com will allow. Also, the very second you park, you have to instantly spring into action, put up your reflective window shade, and close all of your curtains. You might think, but Zion is so beautiful! I came here to bask in the beauty of it all. Doesn’t matter. The beauty means nothing if you’ve collapsed from a heat stroke. Because your eyes will be closed at that point anyway. I now have reflective shades for both the front and back windows and my curtains go all around (I also have covers for the little windows in the roof). A lot of people custom make reflective covers for the rest of the windows, but I keep waiting for someone to sell them on Etsy as that seems like a lot of work. Of course, in addition to shade and reflective shades and curtains, you’ll want air conditioning. My Roadtrek has basically a wall air conditioner in the back (above the living room/bedroom). The air conditioner is not a battery-operated appliance. It’s electricity or generator powered only. This means that when it’s over 90 degrees or so, I’m unlikely to be doing any free/dry camping in parking lots. A cheap and crappy RV site with electrical hookups is like paradise since it facilitates air conditioning. But the RV air conditioner is only going to cool things down maybe 15 degrees or so. So if it’s 107 outside, it’s still pretty hot in the RV. When I got to Zion, I had tons of work to do, so I found an RV park with wifi (and electricity) and I spent most of the time working in the communal game/media room. Everyone else was hiking around, so I mostly had the place to myself. 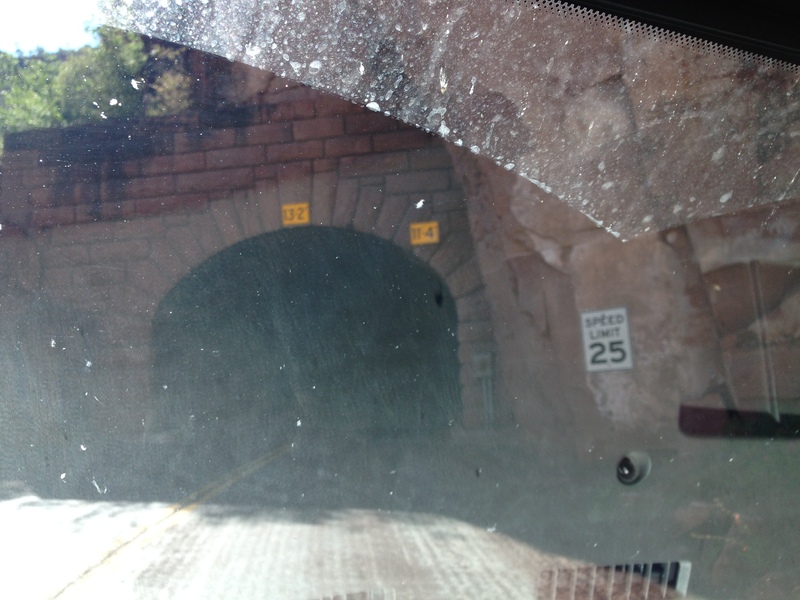 Here’s something you may not know about Zion National Park: There’s this mile long tunnel in the middle of it! Most RVs are so tall they only fit in the middle, so they have to pay an extra $15 to drive through and the rangers close the tunnel to traffic so they can drive through while straddling both lanes. Fortunately, my RV, at just under 9 feet tall fits fine. It seems a little stressful to have to worry that if you veer a little too much to the left or right, you’ll crash into the side of the mountain. 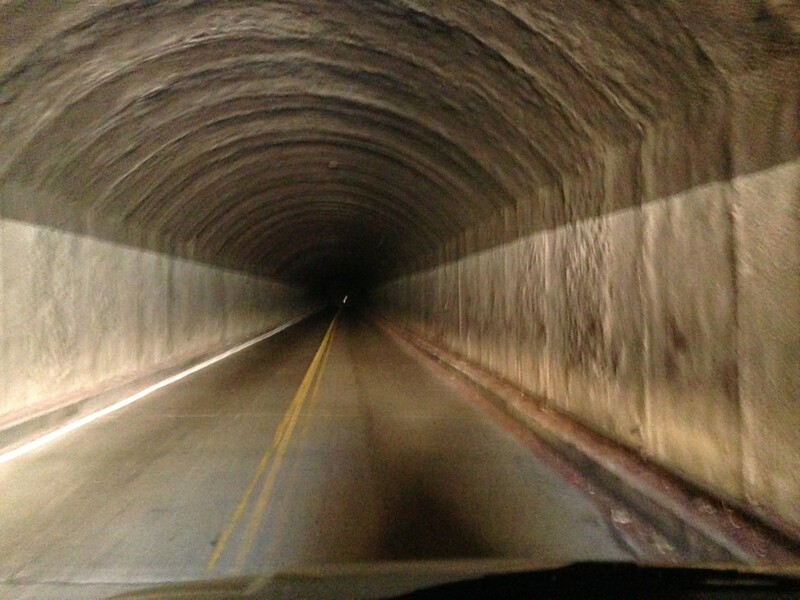 You’ll be happy to know I made it through the tunnel.